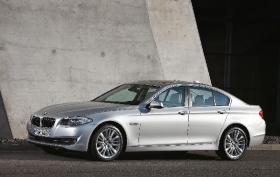 BMW is recalling the new 5 series sedan to repair a defective fuel tank sensor. The company says there have been 10 reported incidents in the U.S. as a consequence of the defect. (Bloomberg) -- BMW AG is recalling as many as 12,400 new 5-Series sedans in the United States and China to fix their fuel-level sensors. The automaker is recalling 6,400 cars in the United States and 5,000 to 6,000 vehicles in China, spokesman Frank Strebe said. Replacing a part of the fuel tank sensor will take about half a day, he said. A flaw means that the fuel sensor can become wedged against the tank, according to the National Highway Traffic and Safety Administration. The fuel gauge in the instrument cluster would then display a higher amount of fuel than was present, increasing the likelihood of stalling as drivers inadvertently run out of gas, the agency said. The new 5-Series, which abandoned the flared headlights and small kidney-shaped grill of the previous version, starts at $44,550 in the U.S. market. The model went on sale in Europe in late March and in the U.S. in June. Sales Chief Ian Robertson said in a June 23 interview that the model had sold out, forcing clients to wait as long as four months for deliveries. Demand for the revamped 5-Series, which competes with Mercedes's E-Class and Toyota Motor Corp.'s Lexus GS, prompted Munich-based BMW earlier this month to raise its 2010 sales and earnings forecast. BMW's Strebe said that there had been 10 reported incidents in the U.S. as a consequence of the defect. The affected vehicles were manufactured from Jan. 12 through July 1, 2010, according to the NHTSA.